Choosing a headstone, monument or memorial for your loved one is not an easy thing to do, but it can be an important step in the healing process. Moss Family Funeral Homes, have compassionate staff that will help walk you through the process of creating a lasting tribute that can be cherished for years to come. 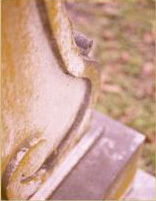 When choosing a headstone, monument or memorial, there are several things that need to be taken into consideration. First and foremost it is important to know what the Cemetery Rules & Regulations for headstones are — the staff at Moss can guide you regarding this. Once you know what kind of memorial can be placed on the grave you can consider the different options you have in choosing a memorial. Moss Family Funeral Homes offer a complete line of quality, affordable funeral merchandise including: Caskets, Burial Vaults, Grave Liners, Cremation Urns, Monuments, Markers, and Memorials, among other items. We have an on-site showroom designed to give you an opportunity to view items up close while making important merchandise decisions. Contact us today or call (630) 879-7900 regarding any questions you may have regarding headstones, monuments, and memorialization.